What a fun grad card! Love the happy colors and that sentiment is so playful and cool :) Thanks for playing with us at CAS-ual Fridays!! Super cute graduation card! I love the colors you used! Darling! Look at all those sweet color grad hats - love the idea and the design!! 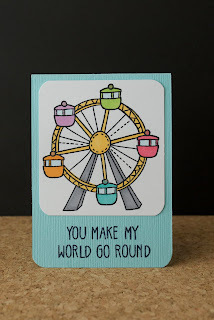 And that sweet card for your hubby is pretty stinkin' cute, too! Thanks so much for playing with us at CAS-ual Fridays! Looking forward to seeing more of your beautiful work!! Holy cow I had no clue those birdies were brackets! Your a-ha moment was crazy great!! Both of today's cards totally rock!! 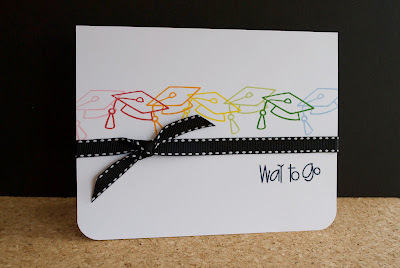 I love the colorful stamping & simplicity of the grad card. Its too fun! And way to go on the ferris wheel!! You colored it perfectly and with the cardstock's color it really pops - I love it!!! This is adorable! Happy you joined us for this week's CAS-ual Friday challenge! Two very sweet cards, Chari! Also, congratulations on your Paper Crafts May Gallery win!! Aw Chari, I love your take on my card! Most importantly, though, I love that cute ferris wheel. You colored it so well! Love all of those colors together. Both these cards are really great fun. I love the coloured graduation caps - looks very funky! 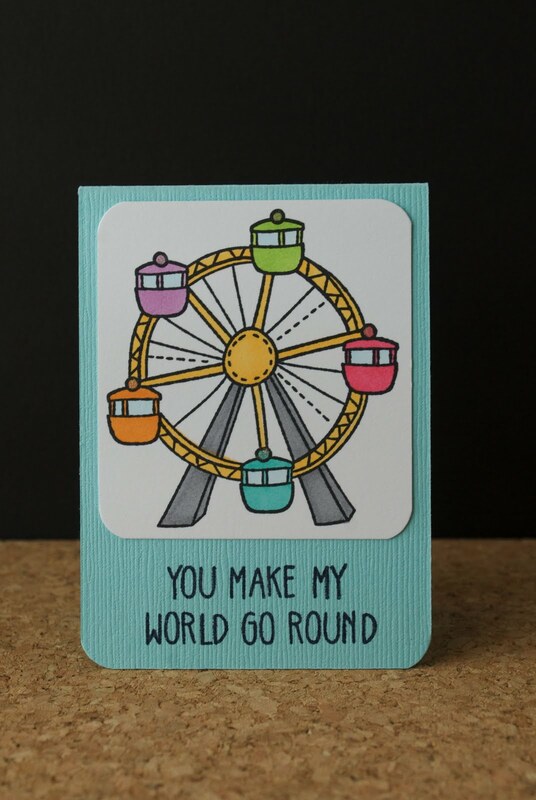 Your ferris wheel is adorable! Super cuts cards! Love the grad hats in the rainbow of colors on that crisp white, fabulous :) Thanks for playing this week at CAS-ual Fridays! Oh oh oh how I love the grad hats in a color instead of black and so many colors! Love that they overlap. Great cards! Thanks for playing at CAS-ual Fridays! I love all the colors in this card, very pretty! LOVE these cards! The colors in the grad hats is such a fun idea! So glad you played along at CAS-ual fRidays! Love how you stamped those graduation hats in different colors. Way to go! Chari. Love that beautiful rainbow of caps. A great CAS design. Thank you so much for joining us at CAS-ual Fridays this week.